What can we say about pokies that has not already been said before? Very little. You probably know all about the endless fun, the pulse-racing action, the incredible features, and the unbelievably big real-money jackpots they offer. What you might not know is that playing them at Gaming Club’s New Zealand online casino makes all the difference! The casino games we have lined up for you are not just any old games. They could be, if we did not give a hoot about our players, but lucky for you, that is not the case. We want you to enjoy the most thrilling online gambling NZ has to offer, which is why our casino is powered by Microgaming. Unleash action so good, you need to experience it to believe it when you spin the reels with us. 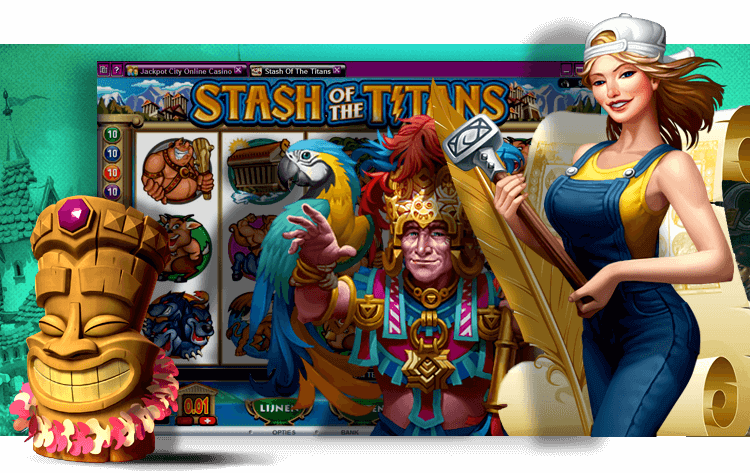 The first thing most Kiwis notice about the online pokies at Gaming Club is the huge variety of themes and styles. Almost everything you could think of has found its way onto the reels, from New Zealand’s favourite sports to characters from your favourite movies. There different numbers of reels from which to choose, and some even blur the lines between online gambling NZ and video gaming. There are NZ$ progressive jackpots to be won also. Whatever your style, there is something for you at our casino online. Our collection of pokies is already the most sumptuous available to players in New Zealand, but that is no excuse for us to kick back and relax. When you play at our casino, you know that opportunities for new action-packed adventures come your way regularly. Microgaming’s prolific release schedule sees to it that Gaming Club is never left behind as far as the latest, hottest titles go. Of course, there are plenty of titles that are as good now as they were when they were first released. Among the most popular at our casino online are Thunderstruck II, Mega Moolah, Avalon, Game of Thrones, Castle Builder, Tomb Raider, and Lost Vegas. There are reasons classics are what they are, and no pokies are more classic than those with 3 reels and a single payline. Play them at Gaming Club, and find out why the early players in Brooklyn and San Fran kept going back for more. If you thought that titles that keep reels and other features to a minimum were toothless, think again, because our games will prove you wrong. The pace picks up in the 5-reel pokies you can play at our New Zealand online casino. Other than offering you more reels and more paylines, they also liven things up with Wild symbols and other features. If you are looking for something more than strictly classic action, but need a break from the intensity of titles packed with special features, you cannot go wrong with 5-reel games. Many Kiwis consider video pokies to be the height, the pinnacle, of reel-based gaming. Play them with us, and see if you agree. There 5 or more reels to spin, multiple paylines, themed games played in second screens, re-spins, free spins rounds, Wilds, Scatters, multipliers, and much more. As exciting as special features can be, players in New Zealand sometimes need more – a whole lot more. If that is what you want, you can make no better choice than to play our progressive jackpot pokies. All we can say is that, with NZ$ jackpots that get bigger before your eyes, the action is intense. Enjoy it all at our casino online.